This performance of Franck’s Piano Quintet in F Minor was the opposite of the performance it received on Thursday evening (by Yury Favorin). That time it was controlled and politely played. With Hsu, the passion dial was turned all the way up. It was an intense experience and Hsu and the quartet took every chance to ramp up the scorching romanticism. Hsu was in constant contact with the quartet and modeled his playing of the material to fit in with that of the quartet. This is the definition of a collaborative pianist. Collaboration is a common plan among the participants about how the pieces will be played. Therefore, it has to have a place in a virtuoso competition. The pianist must have a monster technique and sure musical ideas, but this is not a concerto with a tiny orchestra. Hsu, and a few others in the quintet round, have understood this. His was a cohesive performance that stands out. The Tchaikovsky Piano Concerto No. 1 in B-flat Minor, op. 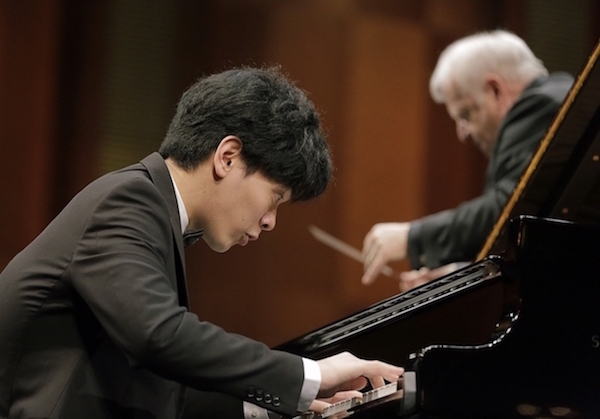 23, is a surefire winner—and perfect to close the competition considering it was the piece that took Van Cliburn to victory in the 1958 Tchaikovsky competition. With a technical whizzbang pianist like Hsu it can bring the house down. And so it went in this performance. Hsu received a cheering ovation for just walking out on the stage. When it was over, the ovation was riotous. He played all the notes in a spectacular manner. He obviously knows the concerto and understands Tchaikovsky’s intent and architectural plan from the first notes to the last.